In unity with our Holy Trinity Catholic Parish, our mission is to place God first in all things, to proclaim the gospel of Jesus Christ, and to grow in holiness through prayer, sacraments, and service. ALL ARE WELCOME! Come one. Come All! ALL women who attend Holy Trinity are invited to join in. Come as you are and grow together with us. To keep up with our events, announcements & prayer intentions, please share your email to us at holytrinitywm@gmail.com. 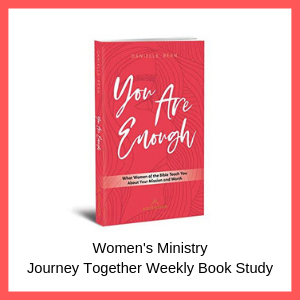 Journey Together Book Study is a fellowship of women who seek to more deeply explore their relationship with Jesus Christ and other Christian women. By reading the selected book, meeting weekly and sharing personal reflections, our goal is to strengthen, refresh, and enhance our faith journey in a welcoming atmosphere at Holy Trinity Catholic Church. REGISTER BELOW!